Stonehenge is a megalithic monument on the Salisbury Plain in Southern England. It is one of Britain's greatest national icons, symbolizing mystery, power and endurance. Its original purpose is unclear, but some have speculated that it was a temple made for the worship of ancient earth deities. It has been called an astronomical observatory for marking significant events on the prehistoric calendar. Others claim that it was a sacred site for the burial of high-ranking citizens from the societies of long ago. Stonehenge is composed of earthworks surrounding a circular setting of approximately 30 large standing stones called Sarsens. Each sarsen stands over 10 feet tall and weighs 26 tons with thirty lintels (6 tons each) perched horizontally atop in a continuous circle. There is also an inner circle composed of similar stones, also constructed in post-and-lintel fashion. 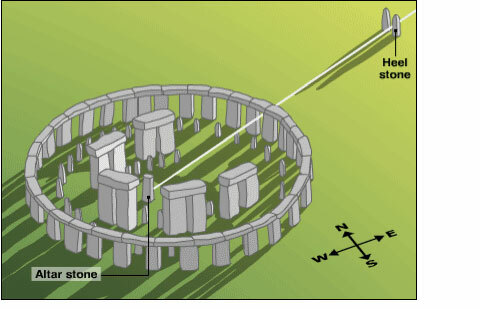 Period I - 3100 BC, Stonehenge was a circular ditch with an internal bank. The circle, 320 feet in diameter, had a single entrance, 56 pit called Aubrey Holes around its perimeter (with remains in them of human cremations), and a wooden sanctuary in the middle. The circle was aligned with the midsummer sunrise, the midwinter sunset, and the most southerly rising and northerly setting of the moon. Period II - 2150 BC, saw the replacement of the wooden sanctuary with two concentric circles of ‘bluestones' (dolerite stone with a bluish tint), the widening of the entrance, the construction of an entrance avenue marked by parallel ditches aligned to the midsummer sunrise, and the erection, outside the circle, of the thirty-five ton ‘Heel Stone'. The eighty bluestones, some weighing as much as four tons, were transported from the Prescelly Mountains in Wales, 240 miles away. During Period III - 2075 BC, the bluestones were taken down and the enormous Sarsen stones - which still stand today - were erected. These stones, averaging eighteen feet in meta-height and weighing twenty-five tons, were transported from near the Avebury stone rings twenty miles to the north. Sometime between 1500 and 1100 BC, approximately sixty of the bluestones were reset in a circle immediately inside the Sarsen circle, and another nineteen were placed in a horseshoe pattern, also inside the circle. 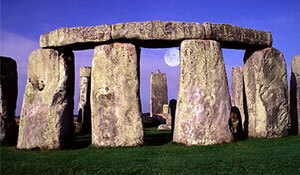 Stonehenge sits on a major Grid Point on this planet as well as most other ancient sites around the globe.